Do you remember Playskool Weebles, those round-bottomed, wobbly toddler toys? You could tip one all the way to the ground, and after some over-correction, it would always right itself. These precarious little people provide a wee picture of my students in our Challenge II debate strand. It usually happens somewhere in the first few weeks of seminar—that moment of shock, wonder, or even incredulity when the students first realize that their personal preferences in art and music are not the highest authority in our conversations. It probably doesn’t help matters when we ever so gently suggest that their predilections are uninformed and immaterial and have been tainted by the Fall. For some strange reason, this information is not well received. The standard that we will use to examine and consider the arts, we tell them, is that of a Christ-centered worldview. “But wait!” they explode, “We already have that, so doesn’t that mean that our opinions are valid?” It is a theory worth investigating, and we have thirty weeks for the experiment, not to mention twelve eager lab rats as our sample pool. The debate strand (even the name is contentious!) is the perfect place for our test. In the Challenge II debate strand, we focus our study on Western cultural history through the emphasis of art and music. We study classic art and music by some of the greatest and most notable contributors in history. “What could be contentious about that?” the students query. Yet even classical artists paint with a tinted brush; even classical music has its sour note. How does an uninformed and tainted Challenge II Weeble find harmony in the debate strand? We begin our experiment with an example of American Realism. A self-taught artist during the age of Realism, Winslow Homer grounded his work in direct observation of nature. [i] His 1872 painting Snap the Whip depicts rural American boys engaged in an exuberant game of the same name. Even though some of the boys strain to hold on and stay connected, the game suggests harmony through strength, strategy, and teamwork—a scenario familiar to many men after the Civil War. [ii] Homer painted his subjects exactly as they appeared, the Weebles enthuse; he avoided outside influence and popular philosophy. But from this experience, Homer’s greatest theme emerged: man’s struggle with nature, especially the sea. His bold watercolors depict brightly colored ships with man, now small and nondescript, at the helm, surrounded by the energy of sky and sea. The Weebles teeter apprehensively. As we examine Homer’s later work, we observe that man disappears altogether from his paintings of the raging sea, asserting its dominance. [iii] Nature has won; Homer has sent the Weebles down for the count. Through our conversations we reconcile with the effects of Realism’s hard edge. We consider that both man and nature have their rightful place in art as they reflect the beauty and handiwork of God. We recognize that Homer allots dignity to children and the working-class man. But the divergent element is the suggestion of nature’s dominance. We allow that man has a rightful place on earth—to have dominion over it—and so we embrace Homer’s idyllic scenes and luminous watercolors but with a wary eye on his theme. After a shaky bout with art, the Weebles turn their attention and renewed confidence to music. After all, what difficulty could there be to find harmony in classical music? We take the fifth—Beethoven’s Fifth Symphony, that is. Facile, revolutionary, and well, let’s face it, a genius, Beethoven and his gifts to mankind are easy for the Weebles to applaud. His orchestral masterpieces challenged symphonic form through repetition, dramatic dynamics, and tense rhythms. The Fifth Symphony (1804–1808) is a classic example. In this famous piece, the Weebles note the lush beauty, driving dynamics and “...a musical statement of anger.”[iv] Anger? The Weebles totter tremulously, but the fact remains: One of the predominant features of Beethoven’s symphony is the profoundness of emotional content,[v] emphasized in his four-note melody “da-da-da-DA!” The Weebles, grasping for stable ground, consider the work of a previous music great, Johann Sebastian Bach. Bach believed that the primary focus of music should be to the glory of God and the recreation of the mind. Beethoven, greatly influenced by the thinking of Goethe and Rousseau, believed it was the artist’s task no longer to evoke emotion but to express his own personal emotions. [vi] Beethoven opened wide the door to music as an expression of the inner reflections of man. Once again the Weebles, rocking dazedly, make an attempt to balance and harmonize diversity. As we listen to Beethoven’s symphony, we thrill at his ingenuity, his lyrical melodies that simmer, then bubble and boil. [vii] No, we can’t discount Beethoven, they agree, but there must be a reckoning. Beethoven’s personal expression of rage had its effect, one that reverberates to the modern music of today. After these rocky encounters, the Weebles begin to cry foul play—none of our experiment samples have been of a religious theme. So, we give them Michelangelo and his exquisite marble statue of David (1501–1504). The Weebles are satisfied; surely the work of a Renaissance giant like Michelangelo will put them on solid terra firma. David stands over fourteen feet tall. His unequaled grace and harmony of design demand that he be given his own niche in one of the buttresses of the Galleria dell’Accademia. [viii] “He is perfect,” the Weebles trumpet. On close inspection we see that David is indeed perfect. A little too perfect. Almost godlike. The Weebles tremble with a familiar trepidation. Michelangelo’s David, with slingshot in hand, is no humble shepherd boy, nor is he the biblical hero who slays the giant Goliath. The statue’s ideal physique and disproportionately large head and hands belong not to the boy who trusted his God to deliver him from the hand of the Philistine, but to the humanistic ideal of the Renaissance man who trusted in the confidence of his own strength. [ix] The Weebles tip to the ground with the knock-out punch. When presented with the choice between two polarized worldviews, biblical truth versus secular humanism, Michelangelo carved a compromise, and once again the Weebles must seek to harmonize their opinion of art with the truth of art. Faced with diversified messages and themes in art and music, the Challenge II students have had their wobbly moments, but like their wobbly counterparts, they do not fall. After a few corrective maneuvers they right themselves, sorting opinion from fact, sentiment from truth. They have tested the assertion that truth will withstand even the harshest scrutiny, and they have learned to reconcile diversity and disharmony. Goodness and beauty can still be appreciated in secular art and music, but when they express ideas that are antithetical to a Christ-centered worldview, there must be a reckoning. For the newly informed and enlightened (but still tainted) Challenge II Weeble, harmony does exist in the debate strand. [i] Artists and Composers Cards “Winslow Homer” [Card 27], Classical Acts & Facts® History Cards: Set 2 (West End, NC: Classical Conversations MultiMedia, 2016). [ii] Albert Ten Eyck Gardner, “Metropolitan Homers [Winslow Homer].” Metropolitan Museum of Art Bulletin, New ser., v. 17, no. 5 (January, 1959). [iii] Carol Strickland, The Annotated Mona Lisa (Kansas City: Andrews McMeel Publishing, LLC, 2007), 84. [iv] David Pogue and Scott Speck, Classical Music for Dummies, 2nd edition (Hoboken: John Wiley & Sons, Inc., 2015), 145. [v] Artists and Composers Cards “Beethoven” [Card 22]. 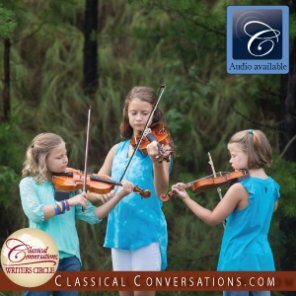 Classical Acts & Facts® History cards: Set 2 (West End, NC: Classical Conversations MultiMedia, 2016). [vi] Jane Stuart Smith and Betty Carlson, The Gift of Music (Wheaton, IL: Crossway Books, 1995), 60–67. [vii] Pogue and Speck, Classical Music for Dummies, 2nd edition, 146. [viii] Steven Zucker and Beth Harris, Khan Academy. High Renaissance in Florence and Rome. Retrieved 8/7/2015 from https://www.khanacademy.org/humanities/renaissance-reformation/high-ren-florence-rome/michel-angelo/v/michelangelo-david-marble-1501-04-galleria-dell-accadem-ia-florence. [ix] Francis Schaeffer, How Should We Then Live? (Wheaton, IL: Crossway Books, 1976), 71–72. Leslie Hubbard received her Bachelor’s degree from California State University, Long Beach. She conducted her post-graduate research in conjunction with the San Diego Zoo and Sea World (and a few pregnant killer whales), graduating with a Master’s degree in Zoology from San Diego State University. She spent two more years in college to acquire a California teaching credential for secondary education. She thought she was educated. It was not until she started homeschooling her two sons, and then, homeschooling them classically, that she truly began to be educated. Leslie has directed Challenge II-IV in her local community (a couple of times over) and has proudly promoted CCs first graduating class “west of the Rockies.” She currently serves Classical Conversations as an Academic Advisor. She enjoys reading, cooking, and silently correcting the grammar of others. She also likes to pretend that she is a farmer. Her greatest pleasure is in being wife and mother to her family, who graciously tolerate her many idiosyncrasies.